‘Resist’ ‘read more books’ ‘understanding’ ‘cycle everywhere’ ‘teach someone something’ ‘second referendum’ ‘ostracise Trump’… how can we break the boundaries that are dividing us? ‘Library’ by Sarah Christie began in the week of the UK’s ‘Brexit’ referendum on 23 June 2016, and continued to form a document of this time of great uncertainty and trepidation. 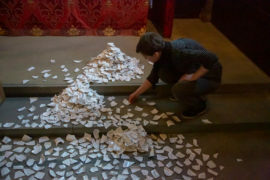 Now in March 2019, as exit from the EU approaches, the entire work of 2000public contributions of words and drawings is on show in Southwark Cathedral. 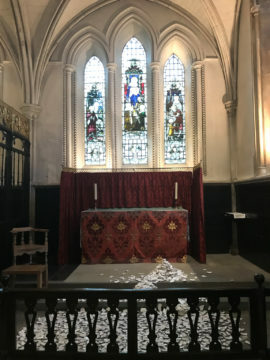 This ancient and beautiful space invites reflection and stillness, and might perhaps help to encourage a longer view and a slower appraisal of where we are, resisting the impulse towards instant reaction. 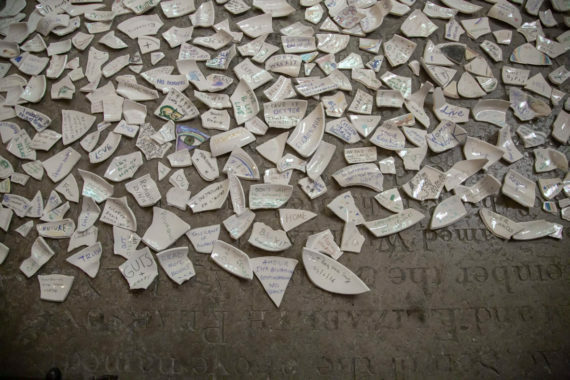 On multiple occasions since June 2016, the public were invited to select a hand-made clay ‘ostracon’, or potsherd, and offer their own words that break the physical and social boundaries that are reappearing and being reinforced by a divisive politics. Some seek to ostracise the architects of that politics. Many more offer reflections, perspective, and a broader and more universal view on life, love, and what needs to be done in a time of profound uncertainty. ‘Library’ has been a long project, and is the work of many hands and minds, with diverse languages and viewpoints represented. Together they form a permanent record of an unsettling and unresolved period of time. ‘Ostracon’ simply means potsherd. The ancient Greeks used them for voting, ‘ostracising’ unpopular figures from Athens. Many ancient cultures used them to convey messages or instructions, similar to letters, or text messages, and their longevity offers us histories of those who came before. 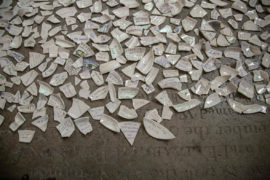 Christie made the ostraca by hand, casting around 200 bowls, breaking them into sherds before firing them, and then glazing each one to render everyone’s words permanent.